Offering you a complete choice of products which include powder flame spray torch, rod flame spray system and wire flame spray system. 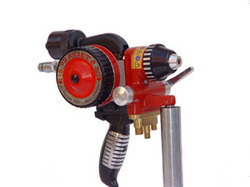 We take immense pleasure in introducing ourselves as the prominent company of carefully designed Powder Flame Spray Torch. 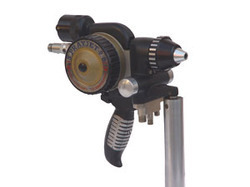 All ferrous metals and weldable steels as well as some non-ferrous parts can be coated through this torch. It can also be used to apply coating on new component. We manufacture this torch with extreme care by using qualitative components and the latest machines at our well equipped production unit. 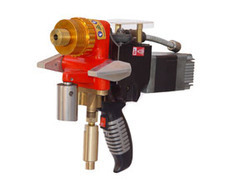 The spray & fuse coating is a two step process which involve a self fluxing alloy coating usually using a thermal spray process and then fusing the coating by applying very high heat (1900-2000º F). This fusing followed by coating forms a metallurgical bond with the substrate. Coatings created by this process form a very dense & high wear resistant coating similar in performance to a hardface weld overlay. But one should take care that the coating material & substrate are metallurgically compatible. Self fluxing type alloys which melts at low temperature and fuse with the substrate. Mostly Nickel, Chromium and Boron based. This process is normally for thin coating say upto 1mm. However, by taking special precaution coating upto 2mm thickness can be produced. All ferrous metals and weldable steels as well as some non-ferrous parts can be coated. Apart from reclaiming worn parts it can be used to apply coating on new component to withstand particular service condition i.e. Wear resistance or resistance to abrasion, hear or corrosion. In fact, inferior metal can be used as base and overlaid by coating of special alloy metal which ultimately saves cost also. 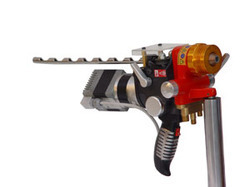 Backed by the skilled manpower and expertise gained over the years, we offer our customers Rod Flame Spray System. The offered system provides a premium coating for wear resistance, corrosion protection, thermal and electrical insulation. It is known for attributes like energy efficiency, impeccable performance, and long working life. The product is designed using best quality raw material and technically advanced machines to meet the needs of the clients. Besides, we offer this at a reasonable price. 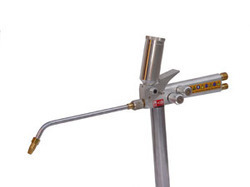 RODOJET 9810 is the state of the art system for combustion flame spraying of ceramic rods. The RODOJET-9810 system is a perfect combination of the low cost operating flame spray equipment & high quality ceramic coating. The unique feature of Rodojet-9810 system is that the rod material is fully melted in the flame stream before being projected onto the surface. No unmoltlen material will be deposited over the substrate. Hence, the molten particles have high kinetic energy and high thermal mass to remain molten until they reach the substrate. To meet divergent demands of the clients in an efficient manner; we bring forth a qualitative range of Wire Flame Spray System. 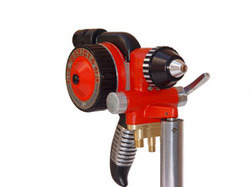 Various industries widely use this system for different spraying and coating purposes. These are acclaimed in the market for their low maintenance, smooth functioning, and high durability. Our products go through stringent quality check on various predefined parameters to meet the standards set by the industry. Besides, we ensure the best quality product at a nominal price. By keeping track of latest market development, we are actively engaged in offering superior quality range of Wire Flame Spray System. The offered spray system is designed with utmost precision by using high-grade components and utilizing advanced technology under the surveillance of skilled professionals to meet the norms and standards set by the industry. Further, these systems are tested by our quality experts to provide zero defect products to our clients at reasonable price. The Flame spraying process is basically the spraying of molten metal onto a surface to provide a coating. Material in wire form is melted in a flame and atomised using compressed air to form a fine spray. When the spray contacts the prepared surface of a substrate Material, the fine molten droplets rapidly solidify forming a coating. This process carried out correctly is called a "Cold Process" (relative to the substrate material being coated) as the substrate temperature can be kept low during processing avoiding damage, metallurgical changes..
We have marked a distinct position in the market by providing Wire Flame Spray System. In this process, the raw material in the form of a single wire or cord is melted in an oxygen-fuel gas flame to form a fine spray. The offered spray system is widely used in various industries as they provide excellent coating facilities at the same time gives minimum heat input to the base metal. We offer this to our valuable clients at industry leading price. The Flame spraying process is basically the spraying of molten metal onto a surface to provide a coating. Material in wire form is melted in a flame and atomised using compressed air to form a fine spray. When the spray contacts the prepared surface of a substrate Material, the fine molten droplets rapidly solidify forming a coating. This process carried out correctly is called a "Cold Process" (relative to the substrate material being coated) as the substrate temperature can be kept low during processing avoiding damage, metallurgical changes.